Last month Prix turned one. It's been an incredible journey. Twelve months ago I had a co-founder in Atlanta, Georgia, a prototype which kind of worked but hadn't been tested, and investor money in a bank-account I had set up weeks earlier. Today we have 15 hotel properties live using Prix as their revenue management solution to price optimally and grow revenues and 20 more properties in the final stages of conversation. And we have an amazing team of 11 people sitting together in Google Campus building the future. It wasn't all smooth sailing. During Christmas last year Artur, our CTO, rebuilt our data infrastructure from ground up while others were feasting on ham and wine. In March I took the scariest decision I've ever taken to focus Prix on the hotel-industry. We had to kill stuff we had worked really hard to build. In total we've been through five dashboards, two backends, four websites, hundreds of candidate interviews and lots and lots of iterations of everything else. We've been in sales-conversations with fitness clubs, ferries, buses, trains and software providers. But it's been worth it. 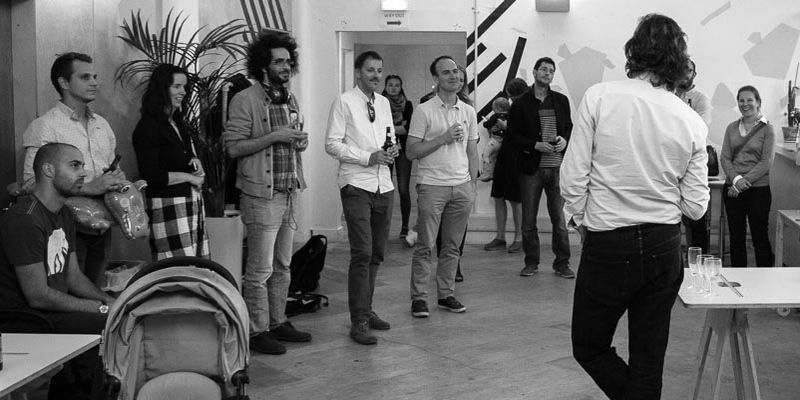 The photo above was from our one-year birthday party at a co-working space in London. It was one week before moving and demolition works commencing on the building. And it was weeks before moving into Google Campus where we had been accepted into their Artificial Intelligence residency. Standing in front of our team I felt incredibly proud of what we've done. That we all had the courage to take a risk on each other. More than pride I felt gratitude that this group of individuals had happened upon Prix or that Prix had happened to them. Because Prix is still only the sum of its people. A company loosely cobbled together by 15 customers, investor capital and a shared story.